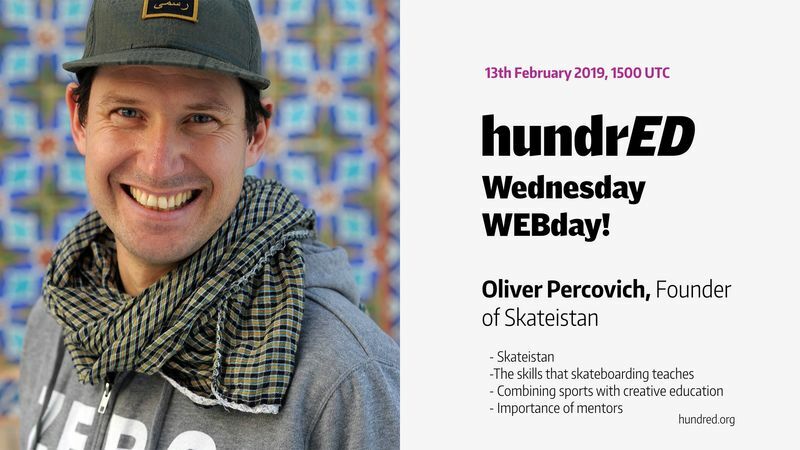 Join Oliver Percovich, Founder of Skateistan (Germany), recognized in the HundrED 2019 collection, as he goes live on the HundrED Facebook Page to talk about how Skateistan makes subjects accessible to a range of abilities by using an arts-based curriculum. Join the conversation on Wednesday, February 13, 2019, at 15:00 (UTC). Oliver Percovich first skated in an empty pool at the age of six while growing up in Papua New Guinea. In 2007 Oliver moved to Afghanistan from Australia when his then-girlfriend took a job in Kabul. Looking to explore, he would skate the city, and street-working kids would follow him around and ask to try. In 2008, Oliver founded Skateistan, a grassroots 'Sport for Development' project on the streets of Kabul. Today, Skateistan is an award-winning international organization with Skate Schools and programs running in Afghanistan, Cambodia and South Africa. The organization is the first international development initiative to combine skateboarding with educational outcomes. Skateistan’s programs are for children aged 5 to 17 with a focus on girls, children living with disabilities and children from low-income backgrounds. Skateistan aims to give youth the opportunity to become leaders for a better world.